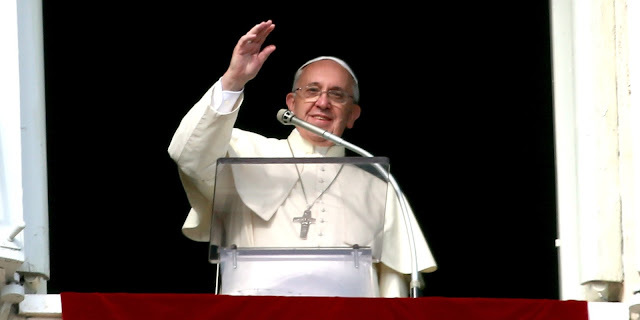 On the Third Sunday of Advent - called "Gaudete Sunday" in reference to the introit traditionally sung at the Mass of the day, which begins, "Gaudete in Domino semper", Pope Francis prayed the traditional Angelus with the faithful gathered in St. Peter's Square, beneath the window of the Papal apartments in the Apostolic Palace. We bring you the full text of the remarks the Holy Father prepared for the faithful, to be read ahead of the prayer. The joy that characterizes the expectation of the Messiah is based on persevering prayer: this is the second attitude. "Pray unceasingly" (1 Thessalonians 5:17), says Paul. Through prayer we can enter into a stable relationship with God, who is the source of true joy. The joy of the Christian comes from faith and from the encounter with Jesus Christ, the reason for our happiness. The more we are rooted in Christ, the more we find inner serenity, even in the midst of everyday contradictions. That is why the Christian, having met Jesus, cannot be a prophet of misfortune, but a witness and a herald of joy. A joy to share with others; a contagious joy that makes life's journey less tiring.